Cockatiels, Nymphicus hollandicus, are small parrots native to most of the Australian continent. There is only one species of cockatiel although there is many color mutations available. They generally range in weight from 75-110 grams and are usually 11-13 inches in length. With good care, a cockatiel can live well into its twenties. A large, clean, well-appointed cage is imperative to your cockatiel’s health and happiness. When selecting a cage and furnishings for your cockatiel, think of the features that you would look for yourself. Size, location, quality, and cleanliness are all important. A cage should be no less than 20”x 20” for a single bird. There is no such thing as a cage that is too large, as long as the bar spacing is not more than ¾”. If the bar spacing is larger than that, your bird could get its head stuck between the bars and hang itself. Also, please do not select one of those tall cylindrical cages. Think of cockatiels as airplanes that move laterally, not helicopters that move vertically. Your cockatiel is on its feet 24 hours a day, so the perches need to be comfortable. There should be a variety of sizes as well as textures so that the bird does not develop pressure sores from having its feet constantly in the same position. The diameter of the perches should be between ¾”-1 ¼”. Your bird should have a variety of perching surfaces available to it. You can use a mix of cotton rope, ribbon wood, manzanita, wooden dowel, and Wild Walk perches. Put the cotton rope perches near the top of the cage because this is where most cockatiels roost for the night. Please try to position the perches so that the bird doesn’t poop in its food, water, toys, or on the lower perches. Also, avoid the sandpaper perch covers and “pedicure” perches. A cockatiel doesn’t have a strong enough grip for those perches to keep the nails filed, and they are very rough on the bird’s feet. You may also want to avoid the cholla wood perches, as these are very difficult to keep clean. As the rope perches begin to fray, you need to trim off the strings or replace the perch so the strings don’t constrict the bird’s toes. You also need to have some type of substrate in the cage tray. Newspaper is the best. It’s cheap, readily available, easy to change and safe. The particulate substrates (corncob, ground walnut shell, paper pulp, and kitty litter) tend to hide the number and consistency of a bird’s droppings, which are one of the first indicators of illness. They can also be dusty or give off mold spores within a day of becoming soiled. Please change the newspaper on a daily basis, so you can monitor the droppings. Now that you’ve got the minimal set-up, your cockatiel wants to have some fun. Cockatiels tend to enjoy “shreddable” toys, such as Bird Kabobs, Shredders, balsa wood, mirrors (not for the girls), and other simple things like plastic beads or Popsicle sticks strung on leather strips. I will list some websites that sell toys that most ‘tiels would enjoy. Unfortunately not all toys are safe for your bird. Avoid bells, (especially “jingle bells”), frayed fabric or rope, rings small enough for the bird to get stuck in and those lead weighted penguins sold as parakeet toys. Colored wood and fabric should be dyed with nontoxic food coloring or child-chewable safe dye. Make sure leather pieces are vegetable-tanned. USAmanufactured rawhide is safe until it gets wet or soiled. After that, throw it away. Also, please remember to rotate toys at least every other week so your bird has some new stuff to destroy. If you don’t already cover your bird’s cage at night, you may want to consider it. A dark colored bed sheet will filter out some light and buy you extra sleep if you have an enthusiastic singer who likes to greet the sunrise each day. Your cockatiel may get a better night’s sleep as well. Cockatiels need between 9-12 hours of shut eye each night, plus naps during the day. You don’t need to cover the cage for daytime naps. Please also consider the location of your bird’s cage. The kitchen is a bad place because of the cooking fumes, smoke, and temperature fluctuations. Birds have been known to land in pots of boiling water and oil. Avoid putting the cage in a very high traffic room, but don’t isolate the bird. Daily interaction and handling is important. Also, avoid putting the cage near a very drafty window, air conditioning vent or right in front of a large window. Cockatiels need time out of their cages every day. A play gym gives the bird a territory away from the cage. There are a lot of options available and it can be a fun place for your ‘tiel to hang out while you watch TV. Most models come with food dishes and you can hang toys. Small T-stands are also available, but these provide fewer opportunities for exercise and mental stimulation. You also need to consider the air quality around your cockatiel’s cage. Cockatiels are very dusty birds. It wouldn’t be bad ideas to have a HEPA filter running near the cage, especially if a member of the household has asthma, allergies, or respiratory disease. Most birds can tolerate temperatures between 65-85 degrees Fahrenheit. If you live in a very dry climate, use a humidifier. Be sure to clean and maintain your machines as per the manufacturer’s instructions. For your bird to stay healthy, you need to keep things clean for him. It only takes a few minutes daily and about an hour for a once weekly scrubbing. You should change the newspaper in his cage tray every single day. You can spray the papers with a little water to keep the dust from flying up in your face. When you’re changing the newspaper, you should also take am moist paper towel and spot clean the poop that may be on the perches and grate. Lastly, you absolutely must wash the dishes every single day. The easiest and most effective way is in the dishwasher. Having an extra set of dishes will be helpful if you don’t run the dishwasher daily. Clean the dishes and try to keep them clean as if they were your own. On a weekly basis you should take out all the perches and toys for a good scrubbing. First scrub all of the poop and other debris off the cage and perches with hot, soapy water. Rinse well, then disinfect with a 1:10 bleach solution. The bleach solution needs a contact time of 15 minutes. After 15 minutes you need to rinse everything really well. When you think you’ve rinsed enough, rinse it a little more, especially wooden items. Alternatively, perches could go in the dishwasher (not with human dishes) after you’ve scrubbed the crud off of them. The hot water will disinfect them. You should also wash the cage cover on a weekly basis. As I said earlier, cockatiels are very dusty birds. Frequent bathing will keep the dust to a minimum. Different birds like to bathe in different ways. Some birds prefer a shallow crock of water, but most seem to enjoy a spray bath. The cleanest way to do this is to stick a shower perch over the bathtub and spray your bird there. A shower perch is a textured PVC perch with suction cups. Start with a brand new spray bottle and mark it “water only”. Set the nozzle to the gentlest spray. Spray the water upwards so that it falls gently down on him. Your cockatiel should be bathed at least 3-4 times weekly, but you can bathe him daily if you like. You should always bathe your bird in the morning, so he has the whole day to preen and dry off. Putting a wet bird to bed is asking for trouble. The water should be a little warmer than lukewarm. If you would bathe a human infant in it, the temperature is probably OK. Also, please don’t ever add anything to the bath water. I don’t care what the guy at the pet store said, plain water is the best. If you think your bird needs to be washed with soap, give us a call. Remember to wash and disinfect your spray bottle and please don’t let it sit around full of water between baths. Empty it and let it dry. You don’t want to spray your bird with bacteria ridden water. One of the most important things you can do to maintain your bird’s health is to feed it a healthy varied diet. A seed only diet is severely deficient in almost every nutrient except fat. It is the human equivalent of eating potato chips and candy bars as your entire diet, every day. Avian veterinarians generally agree that a healthy diet for parrots consists of about 75% high quality pellets, 20% dark green leafy and orange vegetables, and the remaining 5% can consist of treat items, such as seed and fruit. Offering a wide variety is important. Acceptable greens include dandelion, mustard, collard, turnip, kale, endive, escarole, and carrot tops. You can also add carrot, sweet potato, squash, broccoli, and peppers. Occasionally your bird can have a bit of very well cooked chicken, egg, or tofu as a source of protein. Use organic produce whenever possible. There are now several companies that offer organic pellets. If a vet has not seen you bird in the last year, please have him examined before attempting to switch his diet. The first thing to remember when switching your cockatiel’s diet is to take your time. This is a change that will benefit your bird for the rest of its life, so have patience. Also, plan on wasting a lot of food when you start converting your bird’s diet. The first step is to just get the bird used to the presence of the new food item. You can put the new food in a bowl by itself and not change anything else until you are confident that the bird is not afraid of the new food. After a few days, you can start to restrict the amount of seed that the bird gets. I usually recommend feeding the bird in meals. For instance, offer your cockatiel seed for 30 minutes in the morning and 30 minutes before bed time. He is allowed to eat all he wants, but after the 30 minutes is up, pull out the seed and leave pellets in the cage all day. Mixing seed and pellets together and gradually reducing the amount of seed doesn’t always work well because a stubborn bird will just eat all of the seed right away and then not eat again until the next day. Vitamin A and calcium rich vegetables are also important in a bird’s diet. Sometimes the manner in which you offer a food item will determine whether or not the bird eats it. For example, my cockatiels love when I hang large leaves of greens from the top or side of their cages, and large chunks of carrot wedged between their cage bars, but will reject the exact same food items when cut up in a dish. You just need to experiment a little. Don’t give up after you offer something once or twice and the bird doesn’t eat it. After soaking, boil for 10 minutes and simmer for 20 minutes, using only enough water so that none remains after cooking, to preserve vitamins. Grains: ½ teaspoon each: wheat berry, pearl barley, triticale, and brown rice. Add to beans, soak and boil. Organic greens:1/3 of a large leaf of either comfrey (an herb) and/or mustard green. Organic fruit: 1/8 of a large banana, 1/8 large apple, ½ ounce grapes, ¼ teaspoon strawberry or cranberry. Vitamins/Minerals: ¼ teaspoon each of powdered kelp and blue green algae. All of the ingredients should be chopped and mixed in a food processor and frozen into individual servings. An ice cube tray works well for this. This is a 3-4 week supply for a cockatiel. Caution should be taken when re-heating food for your bird. Microwaved food can develop “hot spots”. If you microwave something be sure to stir it well and let it sit for a few minutes before giving it to your bird. Please remember to remove all cooked foods from the bird’s cage within two hours as bacteria can grow after that. As long as your bird is on a healthy, varied diet, please do not add any vitamin or mineral supplement to your bird’s food or water. You can do irreversible damage to your cockatiel’s kidneys and other organs. Over supplementing vitamins and minerals can be even more dangerous than under supplementing. If you have an egg layer, she may need extra calcium. Talk to your vet before you supplement her diet. For your cockatiel’s safety, it must be kept in a secure cage when you are not around to supervise it. There area just too many things that your bird can get into that could hurt or even kill it. Wing clipping can prevent a lot of accidents, but you still need to supervise your bird constantly when it is out of its cage. Some obvious dangers are open containers of liquid, stoves, candles, ceiling fans, mirrors, windows (open or shut), mousetraps, glue traps, and fireplaces. Fumes of any kind should be considered dangerous. Sources of fumes include but are not limited to: overheated non-stick cookware, irons, bread makers, self-cleaning ovens, new heaters, anything that is burning, aerosol sprays of any kind, cooking bags, scented candles, plug-in air fresheners, carpet freshener, hair and nail products incense, potpourri, paint, and cigarette, cigar, pipe, and marijuana smoke. There are also many toxic chewables that a curious cockatiel may ingest. These include but are not limited to: toxic plants, (partial list to follow), and items that contain heavy metals, (lead, zinc, or cadmium), such as stained glass decorations, old paint, costume jewelry, curtain weights fishing weights, wine and champagne bottle foil, coins, duct tape, twist ties, solder, pencils and chalks, some cage paint, and galvanized wire. If you think that your bird has eaten any of these things you need to call your vet right away. Here’s the toxic plant list I promised you: Amaryllis, Aloe Vera, Apple (seeds), Apple Leaf Croton, Apricot (pit), Asparagus Fern, Autumn Crocus, Avocado (fruit and pit), Azalea, Baby’s Breath, Bird of Paradise, Bittersweet, Branching Ivy, Buckeye, Buddhist Pine, Caladium, Calla Lily, Castor Bean, Ceriman, Charming Dieffenbachia, Cherry (seeds and wilting leaves), Chinese Evergreen, Christmas Rose, Cineraria, Clematis, Cordatum, Corn Plant, Cornstalk Plant, Croton, Cuban Laurel, Cutleaf Philodendron, Cycads, Cyslamen, Daffodil, Devil’s Eye, Dieffennbachia, Dracasna Palm, Dumb Cane, Easter Lily, Elaine, Elephant Ears, Emerald Feather, English Ivy, Exotica Perfection, Fiddle-leaf Fig, Florida Beauty, Foxglove, Fruit Salad Plant, Geranium, German Ivy, Giant Dumb Cane, Glacier Ivy, Gold Dust Dracaena, Golden Pothos, Hahn’s English Ivy, Heartleaf Philodendron, Hurricane Plant, Indian Laurel, Indian Rubber Plant, Janet Craig Dracaena, Japanese Show Lily, Jerusalem Cherry, Kalanchoe, Lacy Tree Philodendron, Lily of the Valley, Madagascar Dragon Tree, Marble Queen, Marijuana, Mexican Breadfruit, Miniature Croton, Mistletoe, Morning Glory, Narcissus, Needlepoint Ivy, Nephthytis, Nightshade Oleander, Onion, Oriental Lily, Peace Lily, Peach ( witling leaves and pits), Pencil Cactus, Plumosa Fern, Poinsettia, Poison Ivy, Poison Oak, pothos, Precatory Bean, Preimrose, Red Emerald, Red Princess, Red-Margined Dracaena, Rhododendron, Ribbon Plant, Saddle leaf Philodendron, Sago Palm, Satin Pothos, Schefflera, Silver Pothos, Spotted Dumb Cane, String of Pearls, Striped Dracaena, Sweetheart Ivy, Swiss Cheese Plant, Taro Vine, Tiger Lily, Tomato Plant (green fruit, stem and leaves), Tree Philodendron, Tropic Snow Dieffenbachia, Variegated Philodendron, Variegated Rubber Plant, Warnechei Dacaena, and Yew. 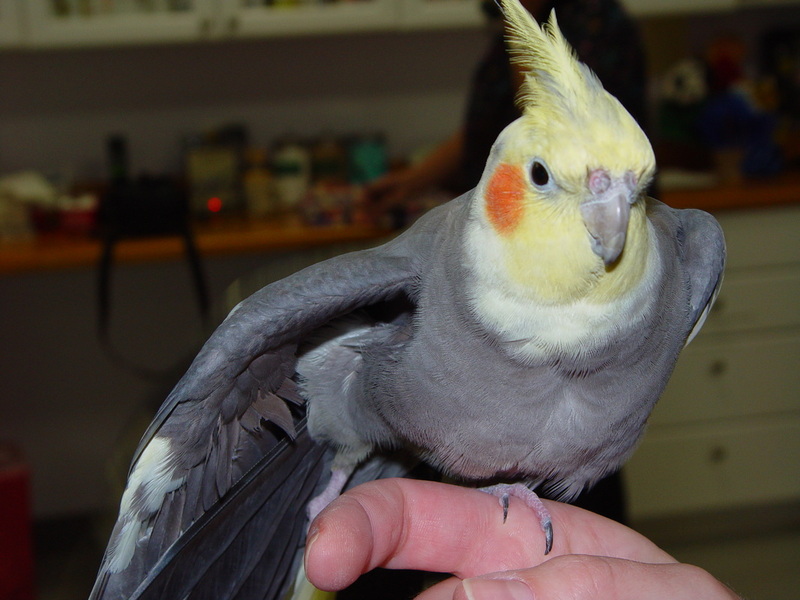 Domestic pets such as dogs, cats, ferrets, and other birds as well as small children can hurt cockatiels. Cat bites/scratches are particularly dangerous to birds because of naturally occurring bacteria on cat teeth and nails. The bacteria multiply quickly in the bird’s bloodstream, resulting in septicemia, which can be fatal. As long as you keep your cockatiels environment clean, feed him a nutritious, varied diet, and take precautions against accidents, you are doing your part to ensure your birds health. However, they do get their share of illness (usually bacterial or fungal in origin), and injuries, usually as a result of “night frights”. A night fright is when a bird flails wildly in its cage, usually at night. Sometimes the reason for the scare is obvious, sometimes it is not. Keeping a night light on near the cage sometimes helps. The girls are notorious for reproductive problems. As a rule, the normal grey cockatiels are healthier than the fancy mutations. So how do you know if your bird is sick? Every new bird that comes home from the pet sore or breeder should immediately be examined and have the necessary lab work done by an avian vet. Pet birds should be examined once yearly, with the appropriate lab work performed. If you think your bird is sick, you’ll need to call your vet. Bird illnesses are not self-limiting, that is they won’t just get better with time. Cockatiels are prey animals and as a result they have evolved to hide their illness very well. A cockatiel that acts sick will be the first one targeted by a predator as well as be picked on by its own flock mates. By the time you notice that your bird is acting sick, it has probably been sick for a while. Signs of illness include any change to the stool (think back to what you’ve fed your bird in the last few hours), excessive yawning, not being able to perch, poor posture while perching (being hunched over), eyes squinted shut not eating, labored or audible breathing, or discharge from the eyes, mouth nostrils or vet. Some of these situations are more critical than others. Call your vet to decide what’s an emergency and what can wait a day or two. The mature girls often have problems with excessive egg laying. This can start as early as one year of age. The problem with this is that some of them lay almost constantly and this depletes their bodies of calcium and other minerals. As the birds overall condition worsens, she can start laying soft-shelled eggs or have difficultly passing the eggs (known as egg binding). If you think your bird is straining to pass an egg you need to call your vet immediately. There are some things you can do to discourage your girl from wanting to lay eggs. Remove all shiny things that she can see her reflection in, remove any toys that she can back herself up against, move her cage furniture around, move the cage itself every few days, and increase the amount of darkness until she has 16 hours of uninterrupted dark and quiet time every day for at least 30 days. Also, make sure that she does not have access to paper to shred; no nest box, and you can put something “scary” but safe in the corner that she chooses to nest in, if applicable. Your vet can talk to you about spaying her or bi-weekly hormone injections. Whenever you bring a new bird home, you absolutely must quarantine the new bird, no matter what the pet store or breeder promise you about the health of the new bird. There are a lot of highly contagious diseases that birds can carry. Some are bacterial or viral. There are some diseases that we can’t even test for and there are some that are fatal. You should keep the new bird on the opposite end of the house as the established birds. When feeding and cleaning the cages, start with the established birds and take care of the new one last. Be sure to wash up very well between birds. You must be aware of outside contaminants as well. If you touch the birds at the pet store, you have to wash up before touching your own birds. Make sure that you take the new bird to your vet ASAP, even before you take him into your home, if possible. If you are ever unsure, please call your vet. ​Thanks, and feel free to call: 847-329-8709.